For other uses of "Fangoria", see Fangoria (disambiguation). Fangoria is an internationally distributed American horror film fan magazine, in publication since 1979. At the height of its popularity in the 1980s and early '90s it was the most prominent horror publication in the world. Fangoria, Issue 7; this was the first issue to exclusively feature horror content. The magazine was released in an age when horror fandom was still a burgeoning subculture; in the late 1970s, most horror publications were concerned with classic cinema, while those that focused on contemporary horror were largely fanzines. Fangoria rose to prominence by running exclusive interviews with horror filmmakers and offering behind-the-scenes photos and stories that were otherwise unavailable to fans in the era before the internet. The magazine would eventually rise to become a force itself in the horror world, hosting its own awards show, sponsoring and hosting numerous horror conventions, producing films, and printing its own line of comics. Fangoria began struggling in the 2010s, due to various issues arising from the burgeoning internet, affecting other publications as well, including difficulty in generating enough ad revenue to cover printing costs. Publication became sporadic beginning in fall 2015, and the magazine ran through a succession of editors in 2015–2016, culminating with the February 2017 announcement of Ken Hanley's December 2016 departure, after which the magazine ceased publication. Various sources offered conflicting opinions as to the publication's future. The magazine remained dormant throughout 2017, although the official website remained somewhat active. In February 2018, it was announced that Fangoria had been purchased by a Dallas-based entertainment company, Cinestate, who said that under the editor-in-chief, Phil Nobile Jr., they would bring back the magazine as a print-based quarterly publication. Additionally, Cinestate has branched the franchise out into films and books, releasing Puppet Master: The Littlest Reich as the first "Fangoria Presents" production and Our Lady of the Inferno as the first "Fangoria Presents" novel under a new literary imprint. In October 2018, Cinestate released the first new Fangoria magazine under their ownership, stylized as "Volume 2, Issue 1.". Fangoria was first conceived of in 1978 by Kerry O'Quinn and Norman Jacobs under the name Fantastica as a companion to their science fiction media magazine Starlog; just as Starlog covered science fiction films for a primarily teenaged audience, Fantastica was intended to cover fantasy films for a similar audience. O'Quinn—a magazine publishing mogul who had earlier enjoyed tremendous success publishing soap opera fan magazines—anticipated a groundswell of interest in the fantasy genre, owing to the plans at that time for bringing Robert E. Howard's Conan the Barbarian to the screen; that adaptation would not appear for another four years. The first issue was assembled under the editorship of "Joe Bonham", a pseudonym taken from the quadriplegic hero of Dalton Trumbo's pacifist novel Johnny Got His Gun. This was a cover for Rolling Stone contributor and screenwriter Ed Naha and writer Ric Meyers, best known for his encyclopedic Great Martial Arts Movies: From Bruce Lee to Jackie Chan. Shortly after the publishing trade press announced the coming launch of Fantastica, the publishers of a Starlog competitor, Fantastic Films magazine, brought suit on the basis of "unfair trade", contending that its young audience would be confused by the magazine's similar title. The launch of the magazine was delayed by several months as the court deliberated the issue. When, in early 1979, the decision was made in favor of the plaintiff, the publishers of Fantastica were without a usable name, and a pressing need to get the long-delayed issue to the printers. Some quick brainstorming sessions resulted in the name Fangoria, over the objections of Robert "Bob" Martin, who was hired as editor during the delay. The first issue went to print July 31, 1979, with a cover date of August. The first issue of Fangoria was entirely designed around the original 'fantasy film' concept for the magazine, and proved to be a notable publishing failure, as were the next five issues that followed, all continuing with the same conceptual approach. By the time issue four was released and issue six was in preparation, the publisher confided to Martin that the magazine was losing approximately US$20,000 per issue, an amount the small publisher could not sustain for long. Two phenomena allowed Martin to reshape the magazine and bring it back from its low-performing state. First was the immensely positive audience response to one of the articles that appeared in the first issue of Fangoria, an article that celebrated the craft of special makeup effects artist Tom Savini, and his very wet-looking special effects for the 1978 film Dawn of the Dead. Second was the response to the sense of defeat surrounding the magazine. With its demise all but certain, senior employees and the two owners of the publishing firm withdrew and allowed the untried young editor to take the lead, reshaping the book according to what he believed would work. The seventh issue, featuring a cover story on Stanley Kubrick's adaptation of Stephen King's The Shining, was the first issue of any US magazine to wholly concern itself with horror films produced in the latter part of the 20th century, with no trace of daintiness about its subject matter. It also was the first issue of Fangoria to achieve a profit. Fangoria Italy, Issue 1. 1990. Subsequent issues would sharpen the focus, but by issue twelve, the formula was well-set, and remains largely unchanged to this date. Martin continued as editor up to 1986, with co-editor David Everitt added in the early 1980s, and after leaving Fangoria worked with film director Frank Henenlotter on the screenplays for Frankenhooker and Basket Case 3: The Progeny. Everitt left the magazine shortly after Martin's departure, and was replaced by Starlog editor David McDonnell, who handled both magazines for several months before turning over the reins to longtime editor Tony Timpone. In the late 1980s and early 1990s, Fangoria tested numerous international horror markets, releasing issues of the magazine modified for various foreign languages. These foreign editions (released in Italy, Japan, Czechoslovakia and elsewhere) lasted only a handful of editions before being discontinued. Additionally, in May 1988, a sister publication titled Gorezone was first published. A second sister publication, titled Toxic Horror followed in 1989. Gorezone was cancelled after twenty-seven issues and one special Tales from the Crypt-themed issue. Toxic Horror was cancelled after five issues. In 1990, Timpone brought in managing editor Michael Gingold, having been previously introduced to his horror-themed fanzine, Scareaphenalia. In addition to his editorial duties at the magazine, Gingold posted the majority of the news updates on the magazine's official website. It was under Gingold and Timpone's tenure that Fangoria rose to its greatest level of prominence, enjoying widespread recognition and influence in the horror community. Creative Group purchased Fangoria (and its parent publication Starlog) in the early 2000s, hoping to branch out the brand identity of the magazine to radio, television, and comics. On December 5, 2007, a warehouse operated by Kable News, in Oregon, Illinois, which contained all back issues of Fangoria and Starlog magazines, was destroyed by fire. As back issues of Fangoria are not re-printed, the only remaining back issues are now housed in private collections or those available on the secondary market. After several failed ventures, Creative Group filed for Chapter 11 on March 21, 2008. In summer 2008, Fangoria and all of its related brands were purchased by The Brooklyn Company, Inc., led by longtime Fangoria president Thomas DeFeo. Under DeFeo's ownership, the magazine's brand identity was radically modified in early 2009. The most notable change was a drastic overhaul to the magazine's cover format, including the transformation of the company's long-standing logo. 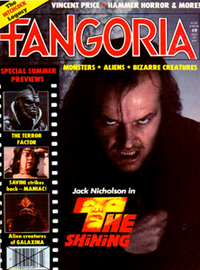 Starting with issue #281, the original Fangoria logo was re-designed and the trademark "film strip", tagline and additional embedded photos were removed. After consistent fan protest of the changes, the original logo returned starting with issue #305. The "film strip" photos returned briefly beginning with issue #309. In February 2010, Chris Alexander, a Toronto-based filmmaker and former writer for Rue Morgue, succeeded Tony Timpone as Fangoria's new editor. Under his management the magazine would explore more esoteric genre content, have its cover layout altered a few times, and several new staff members were hired. Alexander also brought back the original Fangoria logo. In 2011, Gorezone was revived with a special The Bloody Best of Gorezone issue before resuming regular publication with issue #28 in 2013. In 2012, Fangoria also began publishing a line of limited edition specials titled Fangoria Legends. In late September 2015, Alexander stepped down as editor-in-chief and left the Fangoria staff. By October, Gingold, who was then serving as managing editor, was hired as the publication's new editor-in-chief. Eight months later, Gingold was fired after twenty-eight years with the magazine and the former managing editor, Ken Hanley, was named the new editor-in-chief. Many within the horror community responded to shock at Gingold's termination and took it as a sign the magazine had both lost touch with its fanbase and passed its glory days; Guillermo del Toro took to social media to voice his disappointment with the decision. On February 11, 2017, Hanley announced that he too was no longer involved with the magazine and that he had been on hiatus from the company since mid-December 2016. He also stated that if the magazine remained under its current ownership, he felt that there would likely never be another new issue, especially as a print edition. The last print edition of the magazine, issue #344, was released October 2015. Since that time, only four additional issues were published but as digital exclusive editions, leaving subscribers to the hard copy editions, as well as Gorezone subscribers, without the issues they paid for. Additionally, contributors such as Josh Hadley have stated that they remain unpaid for published articles and artwork. Fangoria responded to the statements made by Hanley and Hadley on February 13, in which president and owner Tom DeFeo thanked readers and subscribers for their patience and noted his intention to make amends with writers, artists, and subscribers that had been inconvenienced. The statement also noted that lack of sufficient ad revenue had been the reason for the disappearance of print editions but that DeFeo and his staff would continue their attempts to bring print editions back. In February 2018, it was announced that Fangoria had been purchased by Dallas-based entertainment company Cinestate, who named Phil Nobile Jr., of the Birth.Movies.Death website as its editor-in-chief. The company further announced that they would bring back the magazine as a quarterly, exclusively print-based publication, and offer a one-year free subscription to anyone who never received the issues to which they were entitled under the old ownership. On May 19, 2018, the magazine announced its first licensed novel, Preston Fassel's Our Lady of the Inferno, under their new Fangoria Presents label. The book was released September 11, 2018, to generally positive reviews, ultimately being named one of the ten best horror novels of 2018 by Bloody Disgusting. A week later, on September 18, Fangoria released their second licensed novel, Michael J. Seidlinger's My Pet Serial Killer. In October 2018, Cinestate published their first issue of the magazine, stylized as "Volume 2, Issue 1," featuring a cover story on the 2018 Halloween. Starting in 1985, Fangoria branched out into other media outlets including television, films, radio, and comic books. Beginning in 1985, Fangoria has sponsored annual horror movie conventions known as the Weekend of Horrors in Los Angeles, New Jersey, and Chicago (with Austin, Texas, added in 2008). These conventions were produced in association with Creation Entertainment. After breaking ties with Creation in 2009, Fangoria began their own conventions, titling them the "Trinity of Terrors". In 1990, Fangoria Films was created with the goal of financing one feature film a year under this banner. The first film was 1990's Mindwarp, starring Bruce Campbell. They created Children of the Night in 1991 and Severed Ties in 1992, then ceased production. In 1996, Fangoria Films re-emerged as a distribution company, occasionally using their "Gore Zone" label, to release twenty low-budget horror features over the next ten years. In 2004–2005, Fangoria Films produced and distributed Fangoria's Blood Drive, two DVD compilations of award-winning short horror films. The first volume was hosted by musician-turned-filmmaker Rob Zombie, and the second by MuchMusic's (now called FUSE) Mistress Juliya. In 1991, Fangoria began honoring horror cinema with their annual Chainsaw Awards, which were voted on by readers of their magazine. The winners were announced at an awards show in Los Angeles, California, which was produced by Fangoria's managing editor, Michael Gingold. In association with FUSE TV, Fangoria first televised its Chainsaw Awards in 2006. The event occurred on October 15, and was aired on FUSE on October 22. The event was not renewed for 2007, although the awards continued in the magazine. From 1999 to 2003, they partnered with Bedford Entertainment to attain wider releases of certain Fangoria titles. Movies released during this time included I, Zombie: A Chronicle of Pain, The Last Horror Movie, Slashers, and Dead Meat. Many of these films featured the Fangoria logo along the top of their video/DVD covers, while Fangoria's involvement in other releases was substantially more subdued. From 2006 to 2009, Fangoria worked with Creative Group after it had purchased Fangoria in the early 2000s. Fangoria Entertainment was created as a result. This allowed both parties to agitate the Fangoria brand identity to a number of other media outlets in 2006. Creative Group also added a new "Vampire Skull" logo to Fangoria's properties, which was used extensively after its inception. In 2010, all of Creative Group's Fangoria brands were discontinued. From 2006 to 2007 there was Fangoria TV. Originally conceived as a network television station dedicated to horror films, it was eventually modified to fit a limited online format. From 2006 to 2009 there was Fangoria Radio. Debuting on Friday, June 23, 2006, it was a horror-themed talk radio program which aired on Sirius Radio Channel 108 and XM Radio Channel 139 on Friday nights. It was hosted by Dee Snider and Debbie Rochon, and regularly featured then-editor Tony Timpone. In June 2007, Fangoria Comics was launched. For various reasons, the line abruptly ended a month later in August. Only two series were published: the two-issue series Fourth Horsemen, and the four-issue series Bump. In 2011 Fangoria partnered with producer Carl Amari (The Twilight Zone Radio Dramas) to create Fangoria's Dreadtime Stories, a "Lights Out" style dark horror radio drama series hosted by Malcolm McDowell and featuring original music by Fangoria editor-in-chief Chris Alexander. The show was streamed off the Fangoria website and could also be heard on Sirius XFM. The Fangoria online site features daily updates about the world of horror, allowing the Fangoria brand to remain relevant to those who do not typically read print magazines. The website also features several specialized horror blogs, including articles that continue Fangoria's long tradition of being supportive of LGBT people working in the horror industry. Former editor Tony Timpone was very vocally supportive of Clive Barker's coming-out process in the mid-1990s, and Fangoria.com continued this tradition for several years with Sean Abley's "Gay of the Dead" blog, where he interviewed several dozen members of the gay horror community, including Jeffrey Schwarz, JT Seaton, April A Taylor and Jeremy Owen. Following Cinestate's acquisition of Fangoria, the homepage briefly went offline, replaced by a short video announcing the magazine's return. Thereafter, the homepage has been a simple landing page offering subscribers the ability to contact the new staff, submit inquiries, or subscribe to the new publication. The Fangoria Chainsaw Awards are an award ceremony for horror films and thriller films. Beginning in 1992 the awards were expanded and an annual ceremony was inaugurated to give out the awards. As of 2015, Fangoria also delivers awards to television series. ^ "Looking Into Fangoria, Thomas DeFeo and The Brooklyn Company Inc". www.thedevilseyes.com. Retrieved January 28, 2019. ^ a b McNary, Dave; McNary, Dave (February 15, 2018). "Cinestate Buys Fangoria Magazine, Plans Brand Expansion Into Movies". variety.com. Retrieved January 28, 2019. ^ a b "Fangoria Rises from Premature Online Burial as Print Magazine". Den of Geek. Retrieved January 28, 2019. ^ Monson, Leigh (May 19, 2018). "FANGORIA PRESENTS A New Line Of Novels For Your Horrific Pleasure". Birth.Movies.Death. Retrieved January 28, 2019. ^ "Fangoria.com". Fangoria.com. Retrieved August 14, 2014. ^ "Fires Burn Fangoria - Horror Movie, DVD, & Book Reviews, News, Interviews at Dread Central". web.archive.org. June 9, 2012. Retrieved January 28, 2019. ^ American LaFrance, Delphi, Haven, Marcal, Creative: Bankruptcy 08-10975, U.S. Bankruptcy Court, Southern District of New York (Manhattan), March 24, 2008. ^ Fangoria announces sweeping new web initiative at fangoria.com, Fangoria.com, October 17, 2008. ^ Ryan Turek (February 5, 2010). "EXCL: Meet the New Editor of Fangoria Magazine". Shocktillyoudrop.com. Retrieved August 14, 2014. ^ staff (October 2, 2015). "Announcement: Michael Gingold is new editor-in-chief of FANGORIA". Fangoria. Retrieved October 3, 2015. ^ Graham Winfrey (June 1, 2016). "Fangoria Editor-in-Chief Michael Gingold Fired After 28 Years – Guillermo del Toro and Others Offer Support". IndieWire. Retrieved February 13, 2017. ^ Winfrey, Graham; Winfrey, Graham (June 1, 2016). "Fangoria Editor-in-Chief Michael Gingold Fired After 28 Years – Guillermo del Toro and Others Offer Support". indiewire.com. Retrieved January 28, 2019. ^ John Squires (February 12, 2017). "Former Editor Says There Will Likely Never Be Another Issue of Fangoria". Bloody-Disgusting. Retrieved February 13, 2017. ^ Rich Johnston (February 13, 2017). "The Future Of Fangoria, And Issues Over Payment – We Asked Josh Hadley". Bleeding Cool. Retrieved February 13, 2017. ^ Fangoria Staff (February 13, 2017). "FANGORIA Will Continue in 2017 – Official Statement". Fangoria. Retrieved February 13, 2017. ^ Navarro, Meagan (December 17, 2018). "[Gift Guide] 10 Best Books of 2018 for the Horror Fan". bloody-disgusting.com. Retrieved January 28, 2019. ^ Fourth Horsemen, Grand Comics Database. Accessed June 18, 2015. ^ Bump entry, Grand Comics Database. Accessed June 18, 2015. ^ Ken Williams, "Scary Films--and Fans--in Focus", Los Angeles Times, May 14, 1992. Williams, Owen (April 2013). "Fango Unchained". Empire (286). pp. 110–117. ISSN 0957-4948 – via ProQuest.